Update from November 18, 2018: One of the latest Gutenberg updates removed the PanelColor component, so I updated the code with the instead-to-use PanelColorSettings component. That makes it easier, because it directly allows us to specify custom colors. Update from July 11, 2018: Both color attributes need to be set as attributes in the last code block. Otherwise, the selected colors are not recognized from the color pickers after reloading the browser. The colors are inside an area that can be toggled, and the selected color is shown next to the title of the area. When a color is selected, the paragraph element gets a class and an inline style. First, my solution was to use the PanelColor component, which does not allow custom colors easily, so that was a little trickier than the solution via PanelColorSettings. That component allows us to set a custom color set – but you need to define all used colors via add_theme_support( 'editor-color-palette' ), because that is what Gutenberg uses for generating the color class names. Tell Gutenberg about the wanted colors with add_theme_support( 'editor-color-palette' ). Recreate the color part from the paragraph block. * Remove unused Gutenberg features. //verify if editableNode is available, before using getComputedStyle. 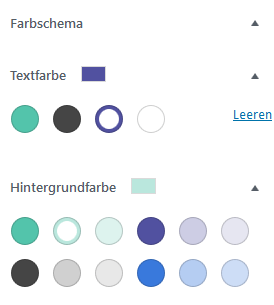 Like already written, the solution is composed of existing Gutenberg components – that said, those definitions and the withFallbackStyles() function in the paragraph block and the PanelColor component. Interesting is the render part. The constants at the beginning are from the paragraph block – textColors and backgroundColors are our subsets of the colors defined in add_theme_support( 'editor-color-palette' ). In the return part, we open a div, in which the class names and the inline styles are outputted. This is also taken from the paragraph component. InnerBlocks is a component, that enables it to insert other blocks into a block, and after that inside InspectorControls we create our color pickers with the PanelColorSettings component. First, we define the title of the panel and pass an array of objects via colorSettings, where each object stands for one color picker. colors allows us to set a custom set of colors (the default colors would be the ones from the add_theme_support( 'editor-color-palette' ) part) – the first one gets our text color, and the second one our background colors. 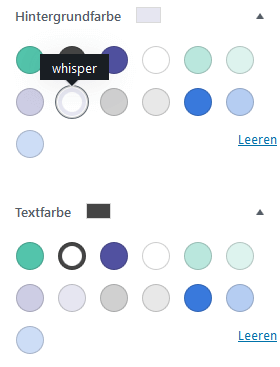 label is the – well – label of the individual color picker, and onChange gets the functions that save the colors (taken from the paragraph block). The value is the hex value and we want to disable that the user can select a custom color. Here we register our block slug/one-column and set a few meta data. edit is our OneColumnBlock class and in save we build the color classes and set them for a div container, that wraps the content of the InnerBlocks. The complete code can be found as a Gist on GitHub. Thank you for sharing this! I've been trying to re-create this block in particular for the color palette panel and have had some very tough struggles getting it to work. Happy it was helpful, thanks for your comment! This is a little off topic but I also found a way to create column block templates that are ready when you add the block to the editor. I posted how I did it on this forum. Just wanted to share since your block uses InnerBlocks.